By way of follow up to my last blog post, I've received a lot of e-mail asking for specific tips about photographing game birds, such as the chukar partridge. I wish I could say it was as easy as picking up a 600mm f/4 lens with a nice window mount, whereupon it becomes immediately possible to capture 5-star images from your climate-controlled SUV. ...then I recommend taking up wild game bird photography for a real treat. Each of the items on that list happened to me yesterday. Luckily, I did manage to obtain exactly 1 photograph for my troubles - which is above average for a typical day. Scouting: The process begins with a scouting trip (or trips) into likely habitat. 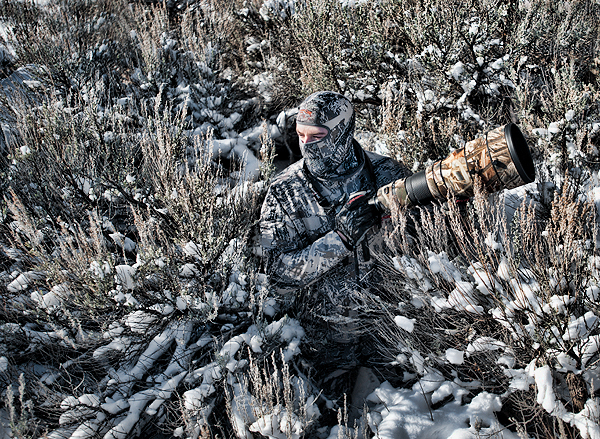 It's important to locate game birds without disturbing them initially, at least if photography is on the agenda. A decent pair of binoculars and a spotting scope are great tools that help cover a lot of country. Patterning: Once you have located a population of birds, you want to watch them for a while. It's quite common for these animals to have a routine. You may find a watering hole, food source, spot where the sun hits first thing in the morning, or travel route that game birds use regularly. During this period of observation, you want to take note of lighting conditions and possible hiding spots. Typically you will want to be in a position where your subject is being lit from the front or side, which needs to be taken into account. Concealment: While non-avian predators and most big game animals see primarily in black and white, birds see in color. Camouflage becomes an important accessory, and it's a good idea to have a few options available to match various types of terrain. 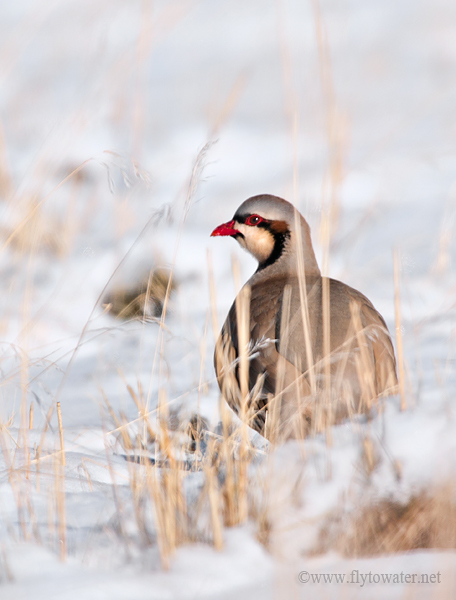 My favorite for chukar habitat is the Open Country lineup from Sitka Gear. This pattern has been specifically designed and researched based on how animals see, as opposed to most products that are based on human vision. I also use a LensCoat to hide the hardware. These are made of neoprene and also provide some protection from dings and scratches in addition to breaking up the outline of the equipment. LensCoat products are available for a wide variety of common camera lenses. 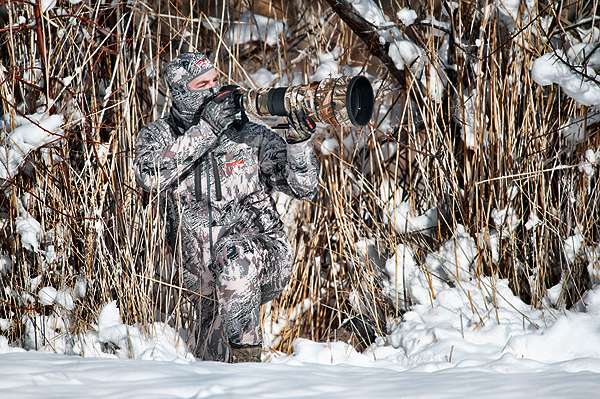 Waiting: Get into position prior to the time you have observed birds using the location in your scouting. In my experience, wind is less of a factor with birds than it is with mammals. Make sure to dress warmly in cold temperatures, because sitting around doesn't create a lot of body heat. Stay alert and be opportunistic - things will usually not unfold exactly as planned. Knee pads are a good accessory in rocky terrain in case you have to move around while keeping a low profile. That's the basic formula. Lather, rinse, and repeat. Thanks to JayMorr, who took the portraits of me used in this post. His blog has additional images and comments about getting TO the shot, which is the main ingredient in getting the shot when it comes to critters. Those camo shots are dope, Brett! Thanks Nathan! 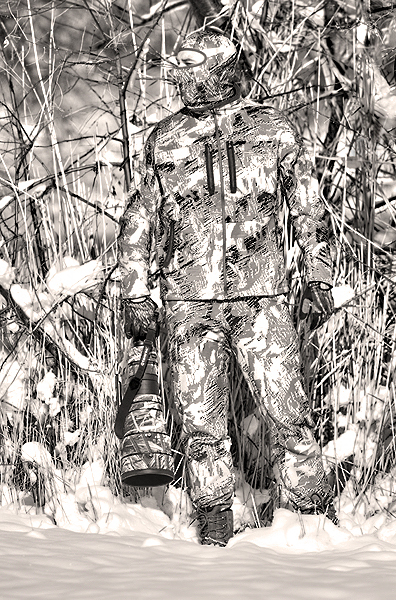 Sitka's stuff is top shelf, it's my favorite camo for this sort of thing and extremely well made. Jason did great work on the photos too. Alex - there are subjects that WANT their pictures taken??? I asked Kate Beckinsale and she told me to go pound sand.